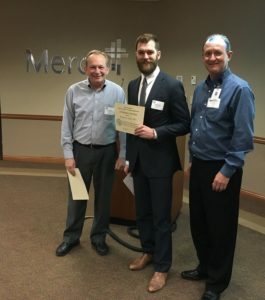 (May 5, 2016) — Brandon Elder, MD, was presented the Missouri College of Emergency Physician’s (MOCEP) R.R. Hannas Resident of the Year Award at the Annual Membership Meeting on May 5, 2016, in Springfield, Mo. He was nominated on behalf of the faculty at Truman Medical Center-Hospital Hill Department of Emergency. Dr. Elder is a graduate of University of Missouri-Kansas City School of Medicine and is currently a PGY-2 resident in the University of Missouri-Kansas City Emergency Medicine Residency. His leadership and involvement with UMKC Graduate Medical Education includes: elected to position of Emergency Medicine Chief Resident for 2016-2017; elected as a UMKC House Staff Cabinet Member; and is currently serving as a resident representative on the UMKC Graduate Medical Education Committee. He has taken on hospital leadership roles including serving on the Truman Medical Center Joint Council on Quality Committee and the Truman Medical Center Campus Safety Committee. He has also been involved in numerous educational activities including presenting at the MO-KAN Resuscitation Academy, and serving as a simulation instructor/coach for the UMKC School of Medicine Emergency Interest Group. To learn more about the R.R. Hannas Award, or MOCEP, please visit www.MOCEP.org. The Missouri College of Emergency Physicians (MOCEP) is a not for profit organization created to support and advocate for emergency medicine physicians practicing in the state of Missouri. MOCEP is a state chapter of the American College of Emergency Physicians (ACEP).